This was actually going to come up last Friday, because I was going to increase my update schedule to 2 days a week. BUT for some reason the file became corrupt, so I had to start over again. That has never happened to me before, ever. But now it did. And it sucked. Oh, Photoshop – why do you hate me? I’m hoping Krishna won’t have a problem with this, but I wouldn’t think so. He’s a really nice guy. <3 And talented, go read PCW now. GO GO. I’ll try updating this Friday again. We’ll see if I can pull it off. This entry was posted on Monday, August 25th, 2008 at 9:37 am and is filed under Comic. You can follow any responses to this entry through the RSS 2.0 feed. Both comments and pings are currently closed. LOL. Brilliant strip! Very cool to see Bob make his appearance in GlitchTown. Nice! Pulled over from Krishna’s blog, and I’ll be sure to check in from now on. Wow, thanks for the comments fellows! 🙂 Much appreciated. It’s perfect because it fits so well with bob’s personality and funny to boot. Gloriuos expression in the last panel…totally cool…krishna is right, this is a pretty cool webcomic! The PC Weenies. 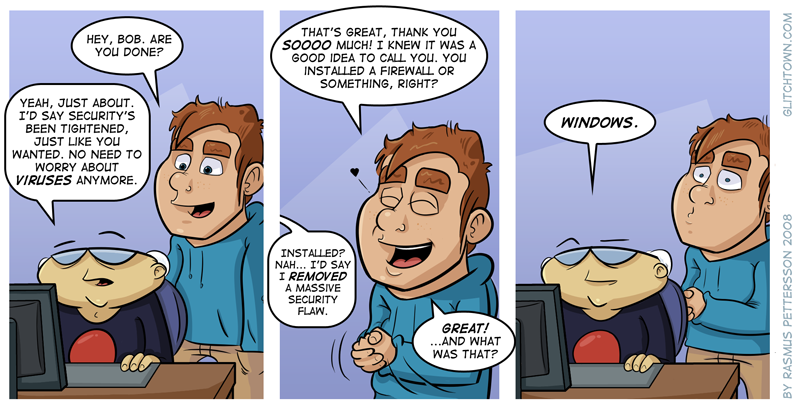 Tech Webcomics for Geeks, and the People Who Tolerate ‘Em. » Archive » Fan Art from Finland!